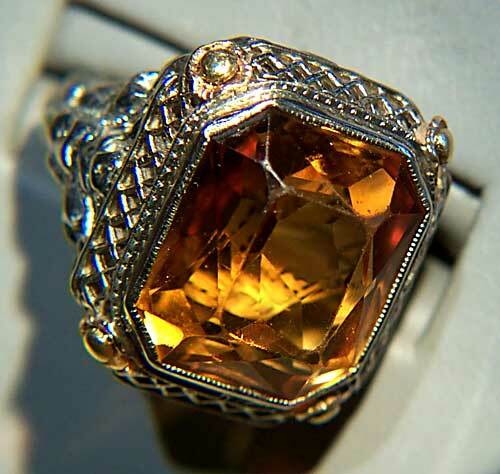 Citrine is a unique stone with a mystery all its own. Although it comes from the French word for “lemon,” it’s far from sour! Its multifaceted beauty and pale lemon to orange color are associated with success and prosperity. In fact, many merchants keep a piece of Citrine in their cash register to attract wealth. Citrine, since its discovery has been a treasured stone, so rare that in the middle ages only the very rich and aristocratic could afford them. Today, thanks to mines in Brazil, Russia and Spain, along with other locations, everyone can enjoy Citrine. It is often found next to amethyst and this stone is called “ametrine.” When amethyst is heated it turns into an orangey, red color giving the appearance of a darker citrine. Vivid shades of yellow, orange and brown are among the updated color palettes for both fall and spring fashions. Pairing citrine jewelry with these popular tones is an easy way to finish off any look with polish and sophistication. If you want to join the trend in Hollywood, choose citrine for bridal jewelry. Instead of the yellow diamonds rings seen on the red carpet, use a citrine to get the same dazzle and shine without the flashy price tag. Ancient cultures referred to Citrine as the “stone of the mind,” believed to increase their psychic power of the elders when placed on his or her forehead. This mysterious stone is also used by healers for cleansing and purifying, and is known for its calming de-stressing qualities. The birthstone of November, and adored for its richness and quality, Citrine is the perfect gemstone to add light and sophistication to any piece of jewelry. Stop in today and look at our beautiful Citrine pieces. Here at Your Jeweler we have a wide selection of gorgeous pieces. Starting November 25th we will be running our “Snow Promo” wher eif it snows 3 inches or more on New Year’s Eve anything purchased between Thanksgiving until Christmas is FREE! Come in today and find the perfect gift for the one you love. We have layaway so you don’t have to pay today. Ladies come fill out that wish list and make the shopping easy for him this holiday season. We are looking forward to seeing you soon!